J-TEC Associates produces flow meters for internal combustion engine air-intake, exhaust and crankcase blow-by flow measurement. 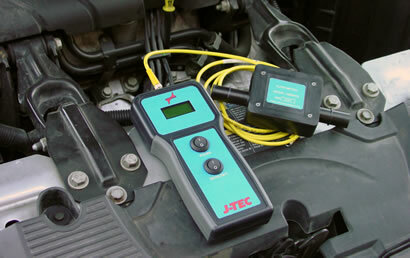 J-TEC’s Blow-By Meter provides an indication of piston-ring leakage under actual operating conditions by measuring the flow out of the crankcase vent or sump vent. Analog or frequency output connects to a dynamometer input channel to record the blow-by flow rate alongside rpm, hp, temperature, etc. Find power that is lost to problems with ring flutter, ring end gap, cylinder wall distortion, ring clearance and ring tension. J-TEC blow-by meters provide all the advantages of vortex shedding flow meters, in a design that is perfect for rugged applications, such as engine dynamometer testing. Our vortex shedding technology produces flow meters with low pressure drop and high turndown ratio, which makes them ideal for measurement of engine air intake, crankcase blow-by and exhaust flows. The patented J-TEC design provides high accuracy and repeatability over an extended flow range. Because the meters have no moving parts, they are rugged, trouble-free and will not wear out. Introducing the new J-TEC HBM453 Flow Meter, designed for car enthusiasts and hobbyists. Visit the website to find out more!